Making Wargaming Scenery And Terrain For 10mm Wargaming. Decently modelled wargames terrain can make a huge difference in the look and feel of your tabletop wargames. It can also play a large factor in strategic decisions and the outcome of the game. 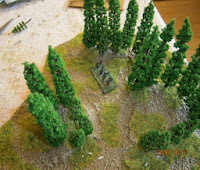 The type of terrain you decide to build depends on the era of the wargames you are playing. These guides will help you build a basic mix of terrain pieces that can be swapped around for different games. Below is a list of projects already completed.